Check - This is the main UI that users will use to run checks. This is kept as clean and straight forward as possible. Manage - This is a bit more daunting and is geared more towards administrators (BIM Coordinators, Cad Leads, BIM/CAD Managers, etc...). Within here you configure and edit the checks. "Enable" the checks, if you uncheck the check is saved but not shown or used when the check is run. This can be useful when you are creating or editing a check, especially in a larger work environment. "Report Only", doing this no longer returns a pass/fail instead when the check is run in the report it will return what was found. It sounds less harsh to return a message that does not have the terms: Pass/Fail. "Allow Correction", for checks that have a common correction you can use this to automate correcting if checked. An OOTB example is the "Firm/Project Standards-Minimal", it contains a check called "Text Uppercase", if you have text that is not set to Uppercase this can review the entire project documentation and automatically change them all to match, pretty handy from an automation standpoint. Another set of examples that are OOTB is the "Revit Modeling and Energy Standards", using this you can take a Design model and quickly prep it for use as an Energy Model, imagine having to do this manually to a few hundred rooms and you can see where the "Allow Correction" option can start to come in really handy. Details: This is the meat and potatoes for most checks. In here you configure or tell the Check what you want to actually do. What is shown may differ based on which "Check Template" was selected. If you would like to review every option available for each Check Template the shipping help file is a great place to start, it lists everything and some common uses for each. "Pick Elements" is sort of an easy button. 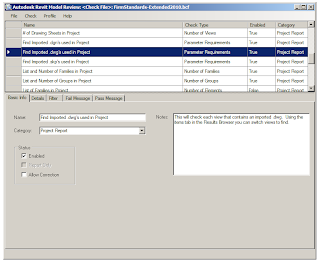 The list of Element Type(s) within Revit can look intimidating, using the Pick Element button you can just pick an object in the project and choose from a list (shown on left for Text) this will then auto-fill out the areas (Element Types, Parameter, Value, etc...) for you. From here you can One area that we will cover in a future post is the use of "Regular Expressions", this is where you can really do some unique things with Pattern Matching. Filter: This allows you t control what elements are checked. A common use is to specify which items should/not be included when checking. An example of this can be found in several of the checks, notably the "GSA Template Standards". Within this the Room Name ignores Rooms that are smaller than 9 SF and anything larger will check their names against the values listed in the PBS Business Assignment Guide. 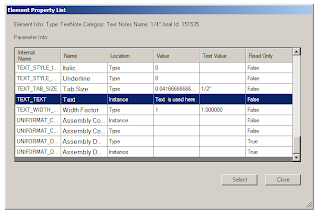 If you are finding that some checks take longer to run, you can use a filter to reduce the need to scan the entire model and focus on a specific set of categories (ex. only apply this to Doors and Windows vs. every object in the model). Fail/Pass Message: This is a HTML WYSIWYG editor, if the check passes or fails this controls what is displayed to the user. You can use images, text, tables and variables to get more control and give the report meaningful information. Do you have any items or checks in particular that you would like to create? Let me know so I can share some more of the required steps and planning behind creating more complex checks.